NFC South & AFC East previews on NNR tonight 6 PM EDT on or https://fryingpansports.com/radio-show/. 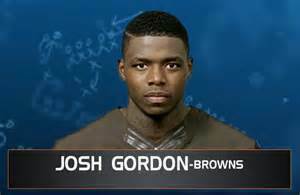 Josh Gordon’s camp is now claiming that the failed test was due to 2nd hand smoke. My question is this: Are you really so needy to be around your peeps that smoke pot that you are willing to throw away your NFL career to stay with them? I have said before that Gordon may be too stupid to be a Brown. But that was when we all assumed that the failed test was due to him smoking weed. If (and excuse me if I don’t believe a repeat drug abuser) the 2nd hand claim is true, he looks even dumber! If that is the case, not only is he giving up millions of dollars, he is letting down a city that has had very little to celebrate over the last 50 years. If he is suspended indefinitely I doubt we will ever see him back in the league. Nothing in his background gives me any hope he can stay clean for 12 months and be re-admitted to the NFL. I expect that he will fade away in a cloud of blue-gray smoke. It would not surprise me to see him more dedicated to weed and his buds than he is to the NFL. He has already given up his college career at 2 schools for it. Now we will see if he is man enough to step up and change his life before he loses his career.